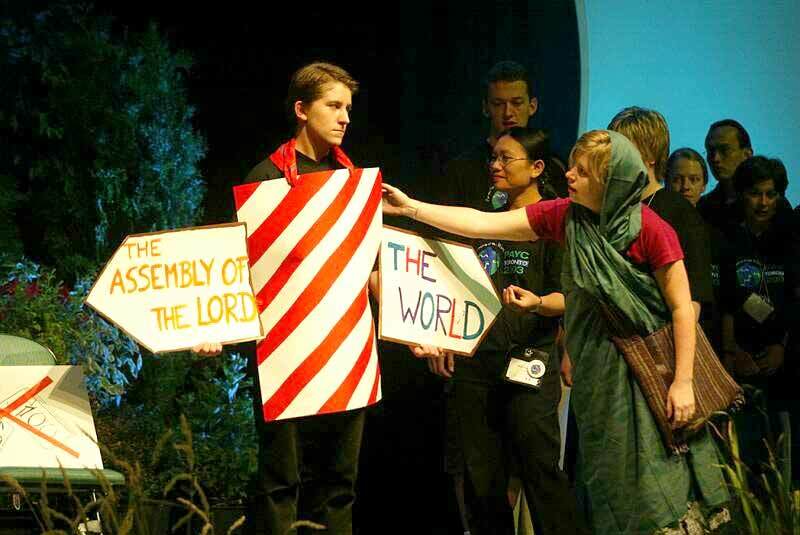 Youth delegates and stewards used the story of Ruth (Ruth 4:13 – 17) as a metaphor for the day’s theme, "Reorder Power." In a breathtakingly relevant dramatization, they portrayed the exclusion that Ruth might have felt by holding up a sign that read "VISA," in reference to the 51 individuals who had been denied visas by the Canadian government. They also portrayed other groups whom society and the church often reject, those with HIV/AIDS, the poor, the disabled, gay and lesbian persons, and others who experience the pain of exclusion. 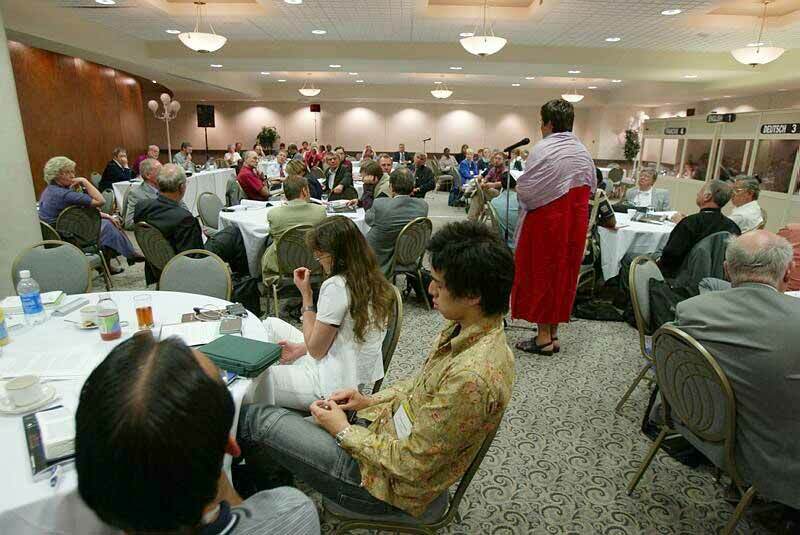 They concluded with the message of "God’s radical inclusion" that embraces the whole world. Village Groups are a central feature of the Tenth Assembly. This is where Bible study discussions occur, and where important implications of the Assembly theme are pursued. Work in the Village Groups develops the substance of the Assembly Message and commitments, through exploration of ten topics based on the Assembly’s overall theme, "For the Healing of the World". Delegates indicated their preference for a Village Group in advance. 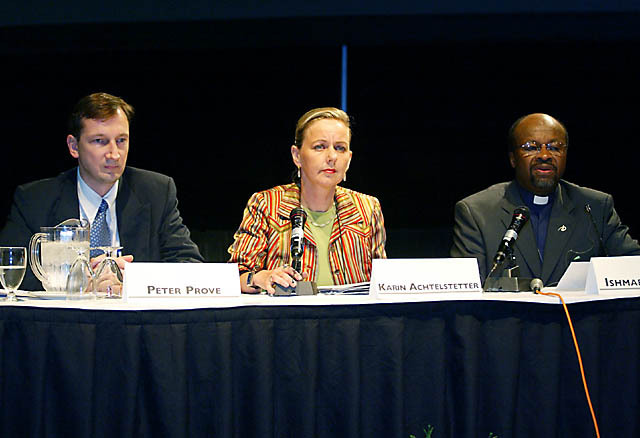 The Village Groups are delving into such issues as God’s Healing Gift of Justification, The Mission of the Church in Multi-Faith Contexts, Justice and Healing in Families and Transforming Economic Globalization. At a special press conference, the Rev. 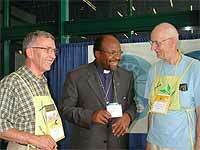 Dr Ishmael Noko, LWF general secretary, released a letter that he had just faxed to the Hon. Denis Coderre, minister for citizenship and immigration in the Canadian government, requesting answers why 51 individuals had been denied visas to enter Canada to attend the Assembly. Specifically, Noko asked Coderre to respond to allegations, reported in the press as supposedly stemming from ‘"federal sources", that the individuals denied visas include “alleged murderers, embezzlers of church funds and other criminals”. Noko wrote, “I ask you urgently to inform me if these reported allegations are indeed emanating from Citizenship and Immigration Canada, and if they correctly represent the position of your Ministry”. A key element of the LWF Tenth Assembly in Winnipeg is the management of over 700 volunteers who are working to ensure that the Assembly runs smoothly. When they submitted their applications to serve the Assembly, volunteers indicated their availability, language capability and work area preferences. Most volunteers are from the Evangelical Lutheran Church in Canada (ELCIC), the host church; others have come from the Evangelical Lutheran Church in America and the Anglican Church of Canada. An additional corps of 100 youth volunteered to assist in the Sunday, July 27, ecumenical celebration at The Forks. Ms Rhonda Lorch, ELCIC director of administration and chairperson of the Assembly Local Committee, commented "the commitment of time and talent by our volunteers has been astounding. The Assembly will benefit from the enthusiastic, energetic and faithful sharing of gifts." Assembly T-shirts are big sellers in the Assembly bookstore, but so also are Luther’s Works on CD-ROM. 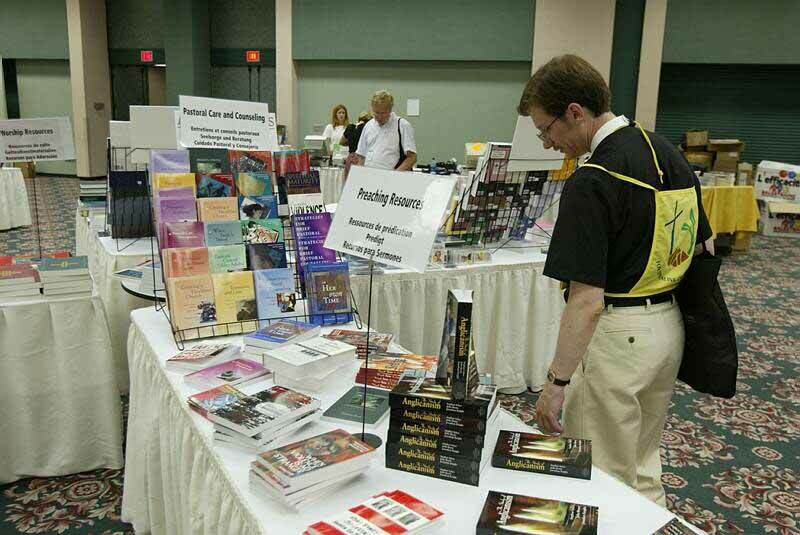 Clergy shirts and vestments, worship paraments and the liturgical resource book, Sundays and Seasons, also find their way into the complimentary Augsburg Fortress Canada book bags at the cash register. CDs of the musical group Krystaal, and a book describing the journey of three brothers in the group from the Democratic Republic of Congo to Saskatoon, Saskatchewan, Canada, illustrate more of the variety available at the Assembly Bookstore. In another corner of the bookstore is the place for participants to view and order photos taken by the Assembly media team.